Right from the start I knew I was going to love this French film with English subtitles. And I wasn't disappointed, this is a five star film all the way through, I cannot recommend it enough. Jean Reno (Leon) plays the main character Charly Mattei, a Mafia boss who wishes to leave the limelight and he lives his dream for three years, looking after his second wife and child. His best friend from childhood marries his first wife and brings up Mattei's daughter as his own, until one morning when Mattei drives into an underground car-park, in Marseilles where he is suddenly attacked by an armed gang who shoot him 22 times, hence the name of the film, but I do believe that the French title may be L'Immortel. You do have to read rather fast as the dialogue bounces along at quite a pace, but the advantage of DVD and Blu Ray is that you can pause so no important bits are missed without disturbing the film. This is a film fuelled by pure adrenaline as Reno dispatches the enemy in his own inimitable style. This is directed by Richard Berry (The Black Box) who keeps the action moving at a fast pace with violence and intrigue at every turn. 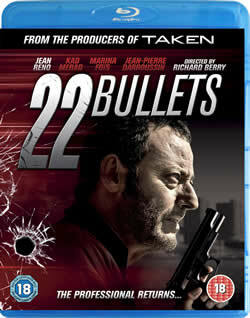 22 Bullets is available to buy on DVD and Blu Ray now.